Living in Korea has invoked within me a lot of thoughts regarding place--not just where I'm located within a physical landscape but where I stand within my generational landscape. 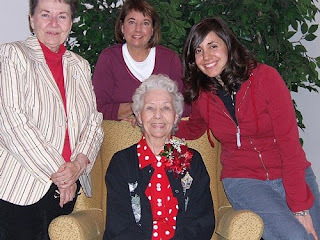 Last Sunday I got to thinking about my grandma Koford--about her impossibly endearing giggle and her love of books and the way she plants kisses all over her grandchildren's faces with such remarkable urgency you just hope your cheeks are still intact when all is said and done. I was thinking about her warmth and generosity and the way it felt to hold her hand when walking through the library as a little girl. I thought about how the beauty of her was gifted from her mother--my great grandma--who has the same infectious giggle, the same unfailing compassion, and the same slender fingers. The beauty of my grandma was also gifted to my mother who I like to call the baby whisperer. Children are mesmerized by her. She is engaging and light--flirtatious to everyone around her in a way that makes people feel immediately loved by her. And she, too, has the same comforting, feminine hands and laughter that found their home in my grandma and great-grandma. What is both astounding and comforting to me is that I am part of these women--these remarkable women have found their home in me; many of their gifts have become my gifts. I am my mother's daughter, my grandmother's daughter, my great-grandmother's daughter--there is no other legacy I would rather claim. This has become one of my happiest revelations. To them I say thank you and happy, happy Mother's Day.